This tournament is designed play a good quality tournament to start your team's Fall of 2015 season (there are no limits on guest players). Get from 3 to 4 quality games played in a weekend. -- Awards: The winning team will receive a complete uniform set for all its players. The top two teams will receive a team trophy. The top two teams will receive medals for r individual trophies for each player. -- Minimum 3 games. Two games on Saturday and 1 or two games on Sunday. -- Very Flexible Schedules. Send your requests before the registration deadline. -- Location: Most games will be held at Herman Brown Park. -- Deadline to register a team is Monday, August 24, 2015. -- Schedules will be ready on Tuesday, August 25, 2015. 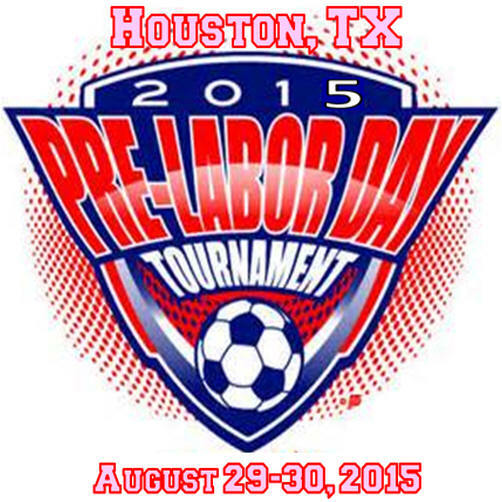 Entre Fee per team: $100 plus referee fees for 6v6, $100 for 8v8 teams and $100 plus referee fee for 11v11 teams. -- The team representative will turn-in the official tournament roster must be turned in (download here). -- The team representative will show the tournament officals a copy of the birth certificate and a player ID (the tournament will not keep anything except the official roster). Awards: The winning team will receive a complete uniform set for all its players. The top two teams will receive a team trophy as well as individual medals for each of its players. Referee Fees: Each team must pay the referee fees "before" the game starts: $30 for 25 minute-half games and $35 for 30 minute games. Maximum Number of Players: The maximum number of players a team may have is 12 for a 6v6 team, 14 for 8v8 and 18 for 11v11. Proof of Age: Coaches must have a folder with all the player's copy of birth certificate and a an ID with the player's picture and name on it. This documentation may be required at any moment. Protest of Player's Age: A team may protest the age of up two players from the other team. The other team must produce the proof of age of each of the protested players. Failure to do this will result in the suspension of the player. Furthermore if the player looks much older (by the tournament director) and the player has played, then the team may forfeit the game. Pre-Game: Pick up from the referee or the tournament table the game roster form (the sticky form). Fill-it in and turn it in to the referee along with the referee fee "before" the games begins. Point System: 3 points for a win, 1 for a tie and 0 for a lost. Tie breakers: Most Points, best goal differential, more goals scored, head-to-head and coin flip. Extra Time: In games where there has to be a winner, there will NOT be extra time. The winner will be determined by FIFA style penalty kicks. Schedules and Results. Click on the age group below.